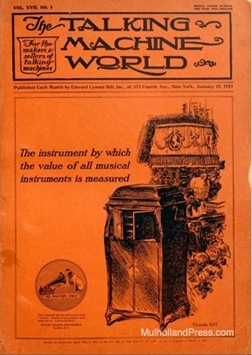 From the pages of the Talking Machine World, the journal of the industry, comes this series of advertisements from many of the manufacturers of phonographs in the early twentieth century. Clicking on the brand name will take you to an advertisement for the brand. Most of the brands listed were small manufacturers who were in business for only a few years. Early manufactures (typically 1900-1910) were litigated out of business for patent infringement. The majority of these small manufacturers operated in the period of 1917-1921. World War I caused a severe shortage of phonographs when companies such as the Victor Talking Machine Company turned their factories over to war work. The large demand was filled by hundreds of small companies who briefly prospered until overproduction and a recession doomed the weaker companies. The lucky ones made it all the way to 1926, when electrical phonographs were introduced and radically changed the market. The very lucky ones lasted until 1929, when the great depression and radio combined to wipe out nearly all demand for phonographs. This page is a work-in-progress, and new names will continue to be added.